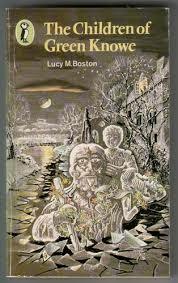 Among other Christmas presents I received the DVDs of The Children of Green Knowe (1986, from the novel by Lucy M. Boston ) and A Traveller in Time (1978, from the novel by Alison Uttley ). The two novels have been favourites of mine since I was young and I remember enjoying both adaptations immensely when they were first shown. I’ve seen Children a number of times over the years, thanks to a video transfer available on YouTube, but Traveller only finally came out on DVD in late 2015. The BBC never repeated it after its initial airing and I had been longing to see it again. The short version of this is going to be that the tv adaptation of Children has lasted far better than the adaptation of Traveller, in part for technical reasons, in part because the adaptation of Traveller manages to highlight all of the novel’s weaknesses and none of its virtues. There is only ten years between the two tv adaptations but technically a lot apparently happened in that ten years. 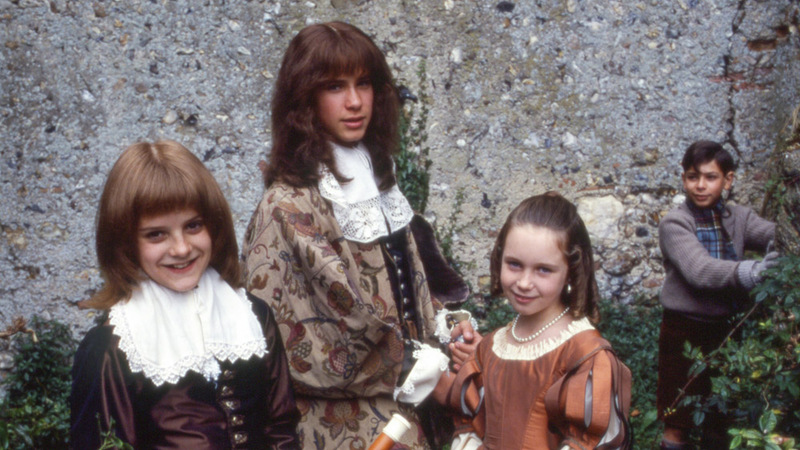 The Children of Green Knowe looks as fresh as ever; it’s very difficult to believe that it is thirty years old. A Traveller in Time, only eight years older, looks visually awful; in parts it seems terribly bleached, and there is occasional interference visible on the screen. This was very much a quick and dirty transfer to DVD, with very little in the way of titivation. The shifts between indoor studio scenes and outdoor scenes are often extremely awkward, and the painted backdrops of ‘outdoors’ seen through doors are quite obviously artificial. The soundtrack is also very fuzzy at times (though the poor choice of a very over-ripe orchestral version of Greensleeves as the theme tune is another matter altogether). It’s made even more awkward by a decision to update the story, moving it into ‘the present’, a decision which provided some unexpected visual distractions that I’ll return to. Before I deliver a more detailed verdict on both adaptations, I’d like to step back slightly and look at the novels again. 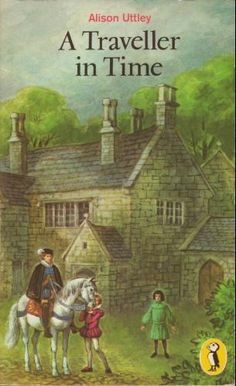 The Children of Green Knowe, I’ve written about before, but not A Traveller in Time, though I know I’ve mentioned it in various places at various times. Oddly, what hadn’t struck me before my Christmas viewing was how similar in some ways the two novels are. Each concerns a child moving effortlessly, inexplicably, through time, becoming somehow caught up in the stories of the people they meet, in the history of the house, and also having to face up to the deaths, long since, of the people they have encountered. I tend to call these novels ‘ghost stories’ simply because that’s what I’ve always called them, but the very title of A Traveller in Time indicates it should be thought of as a story of time-slippage, though the situation in The Children of Green Knowe is made a little complicated by the awareness of the seventeenth-century Oldknow children that they are dead. Here, it is not Tolly who moves through time so much as the other children who fade in an out of Tolly’s own time. And in each novel, the house – Green Knowe and Thackers – stands as a character (each fictional house has an actual counterpart – Hemingford Grey manor house, owned by Boston herself, and Dethick Manor farmhouse, originally owned by the Babington family, and known to Uttley in her childhood); each house is dominated by a woman, Mrs Oldknow, and Tissie/Dame Cicely Taberner, respectively, who functions as the genius loci of the place, and possibly bears some slight resemblance to an idealised version of the author in each instance. Beyond that, it would also be not unreasonable to say that Boston and Uttley themselves had a certain amount in common, given that they both seem to have had rather challenging personalities. Both novels begin with a decision made to send the child protagonists away to the country. In Green Knowe, Toseland, or Tolly, is to spend Christmas with a great-grandmother he didn’t know he had, rather than languish at the rather dull boarding school where he normally lives, his parents being in Burma; in A Traveller in Time, the three Cameron children but Penelope in particular, have been unwell, and their mother decides to send them to an aunt in Derbyshire, to recuperate. So the first major event in each novel involves a train journey, with the protagonists moving away from all that is familiar, heading deep into the uncertainty of the countryside. Both train journeys present us with a picture of close-knit community; in both cases, the children are identified by other passengers as not being from around here, and in neither case is there a clear sense that they belong although they have a loose family connection to the area. Tolly’s first name, Toseland, is recognised as a local place-name but oddly, despite the family being known locally, there seems to be no awareness that Toseland is also a family forename. For all that he has lived in the interim setting of a boarding school (and possibly abroad himself) we are to understand Tolly Oldknow as returning to his house. Boston specifically frames his arrival as a return, and has Tolly anxiously ask if the house is partly his. Penelope’s attachment to Derbyshire is indicated first by her middle name, Taberner; it is her mother’s maiden name, and the family name of the aunt and uncle, brother and sister, with whom they will be staying. Penelope, we will also discover, is also a Taberner family name, so Penelope’s attachment is doubly emphasised by her naming. Her family name, though, is Cameron – her mother married a Scot, and I think by this we are supposed to see Penelope as both belonging but being somewhat ‘other’ too, in that a part of her belongs even further north. 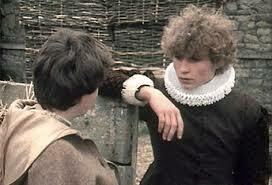 The tv adaptation of Children was mostly filmed at Hemingford Grey; even if one didn’t know that one would feel a ‘rightness’ about the adaptation’s setting, inside and out, in a way that just isn’t there with the adaptation of Traveller. My sense is that the interior shots are mostly studio-based, simply because of the enormous amount of room available for the actors and crew to move around in, not forgetting those unconvincing outdoor backdrops glimpsed through open doors. Having said that, the shots of the modern-day farm interior, the kitchen at least, seem to have been filmed on location, which makes the juxtaposition all the more uncomfortable. The second major difference between the two novels lies in the protagonists themselves. In Green Knowe, Tolly is seven years old. Alec Christie was twelve when he played Tolly in the tv series, and I’d place the character he played as being about nine or ten. Either way, in both novel and series, he is a very active child, exploring, investigating, asking questions, eager for encounters with the other children living in the house, eager for stories about them. As Mrs Oldknow comments, he’s ready for anything. He is, if you like, coming into his birthright, finding out who and what he is. He might start as an outsider but he is very quickly subsumed into the house and his history. The central theme of the novel is celebratory restoration. Tolly’s arrival at Green Knowe sets in train a process of rejuvenation. While his great-grandmother is aware of the existence of the children it is Tolly’s open desire to engage with the children, not to mention his hunger for stories about them, that initiates a series of discoveries – the key to the children’s toy chest, Linnet’s bracelet previously lost in the shrubbery – as well as a series of curious experiences, such as the encounter with Toby’s horse, Feste, and, at last, the lifting of the curse laid on the topiary man, Green Noah, by the mother of the gipsy horse thief. We might suppose that the encounters with the children are simply the imaginings of a very lonely little boy stuck with an elderly relation, except that Mrs Oldknow matter-of-factly confirms his experiences. She might be humouring him, of course, except that Boggis, as much a genius loci as Mrs Oldknow, also knows all the stories, and can add one or two of his own. By doing so, either Boggis is engaged in some sort of unholy conspiracy with Mrs Oldknow, or he acts as a confirming second party. This is all very real if you are part of the family, and Boggises have been associated with the house probably for as long as Oldknows. For the most part the novel is remarkably unthreatening. Tolly is being inducted into the history of his family, and the house where it lives, the house that by implication will one day be his. The Children of Green Knowe is an introduction to his inheritance, tangible and intangible. By contrast, A Traveller in Time is an account of that which has been lost and can never be regained. It begins as nostalgia – Penelope is clearly writing as an adult, describing childhood experiences; among others, she notes how, when offered a treat, she chose to rummage through the old things in a family chest – but somehow ends as mourning the loss of old ways. We are, I think, supposed to see Penelope as being a little old-fashioned even in her own time. But if Tolly is part of the presiding family in his house, Penelope Taberner Cameron is very different. She is much more passive, an observer but not a participant, and I think this is in part because she is a Boggis rather than an Oldknow, so to speak. Aunt Tissie is aware of the continuing presence of the Babingtons at Thackers – ‘the secret of Thackers’ – but this is something that is not discussed. And, of course, the job of Taberners is to keep secrets. As a Taberner, Penelope can never be a participant, only a guardian. The novel may try to account for this by representing her as a sickly, solitary child, as ‘fey, but the fact is that the linear inevitability of history precludes her doing anything other than witness the beginning of the downfall of the Babington family. She can tell Francis (and in the novel, Anthony) what is going to happen but insofar as either of them believes her, neither of them can do anything to prevent it happening. And this is the biggest problem with the novel as novel. Even though Penelope is ‘family’, she must remain an outsider, because she is a Taberner and not a Babington. The history being played out before her is not her history, although her family has witnessed it and participated in it. One of the enduring difficulties of the novel is how to account for Penelope’s presence at Thackers, how to excuse her comings and going, her strange clothes, the fact that unlike most girls of that time, she can read and write, but that unlike her aunt, she has not the remotest idea how to do anything practical, such as identifying herbs. Her position at Thackers is constructed in such a way that she is constantly privileged and her odd behaviour excused; she rides out with Francis Babington, waits on his mother and step-grandmother, but works in the kitchen too. And to round this off, Francis falls in love with her, and she with him. It is the perfect teenage relationship. This is not to say that A Traveller in Time does not have a story but it always comes back to what cannot be done. Anthony has lost his heart to Mary, Queen of Scots, and is plotting to rescue her while she is at Wingfield. An old tunnel between Wingfield and Thackers is to be reopened and the Queen is to be brought along it to Thackers and hence onward to freedom. The plot, though, will be discovered, though at this stage Babington will not be implicated, and a handy fall of snow will conceal the digging at Thackers. But while this may be the story, it is not the plot, not least because Penelope already knows what will happen. There is a sub-plot in the novel, when Arabella, the Babingtons’ jealous cousin, suspecting Penelope of being a spy, imprisons her underground in an abandoned tunnel, from which she is rescued by Jude, the mute farm boy. He is believed to be ‘touched’ but seems to be more fully aware of Penelope’s nature than everyone else. But even this sub-plot only comes to the fore quite late in the novel and while it is given more prominence in the adaptation (complete with Arabella roasting the wax figure of Penelope that she’s made), it’s not really what the novel is all about. According to Denis Judd’s biography of Alison Uttley, Alison Uttley: Spinner of Tales, the novel was originally rejected by her publisher and had to be reworked, though he provides no detail as to what this involved. He does, though refer to Uttley describing it as the ‘darling of my heart’, and sees Uttley as having written herself into the novel as Penelope, unsurprisingly. However, he seems to regard the novel as being rather more successful in its construction than I do. If Alison Uttley does have one great theme as a writer, it is her childhood in rural Derbyshire, at Castle Top Farm. Her love of the countryside, and of rural ways, is reflected in much of her output, from The Country Child (1931), through the myriad Little Grey Rabbit books, to A Traveller in Time. By far the most successful parts of the novel are the descriptions of country life – if we assume that the novel is originally set in the late 1920s and early 1930s, or maybe even earlier given that the voice of Penelope Taberner Cameron is that of an adult or near-adult, recalling a time when she was a child, we can assume that Uttley is drawing on her memories of her own childhood. 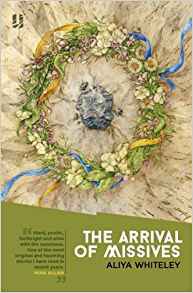 Indeed, a comparison with The Country Child show that many of the scenes, customs and events described in that resurface in A Traveller in Time, where they are often used to establish a continuity between the Elizabethan period and the novel’s present day. By far the best passages in The Country Child, which is anyway fictionalised autobiography, are the descriptions of farm life and the evocations of the natural world, the things that Uttley knew well, and the same is true in A Traveller in Time as Uttley’s instincts as a storyteller override her attempt to tell a different story. The disparity between the two stories is reflected in the two tv adaptations. Although both stay close to the original novels, A Traveller in Time has inevitably been abbreviated to remove the long, lingering descriptions of farm life, meaning that there is very little meat for the adaptor to work with. The adaptation of The Children of Green Knowe is visually gorgeous (perhaps unsurprisingly, given most of it seems to have been filmed at Hemingford Grey). The opening sequence, as Tolly travels deeper into a flooded landscape, swapping train for taxi, taxi for the taxi-driver’s back (reminding us of St Christopher, who plays an important part later in the story) and then piggyback for Boggis’s boat is utterly magical. And that is the point. This is supposed to be a magical story and the adaptation captures that. Which is not to say that it is not at times remarkably atmospheric, and sometimes a little scary. The sequence where Tolly sits on a book so that Linnet cannot read it and she invisibly drags it across the floor is disturbingly effective, as is Tolly’s ill-fated trip across the garden in the dark, when Green Knowe is walking, though for my money, the best, most unnerving sequence is when Tolly is wandering around the upper storey of the stables, searching for the children he can always hear in the next room but can never quite locate. In odd places it also visually reminds me of Lawrence Gordon Clark’s adaptation of M.R. 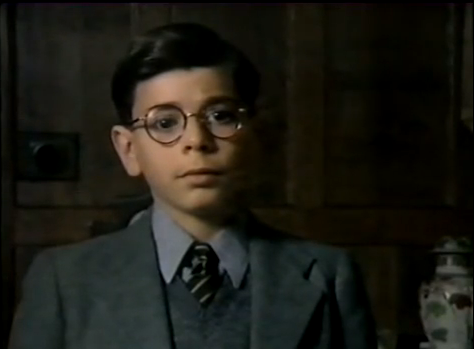 James’ ‘Lost Hearts’ (1973), when young Stephen (coincidentally played by Simon Gipps-Kent) is wandering in the grounds of Aswarby Hall and hears children’s voices. Strangely enough, A Traveller in Time also reminds me strongly of ‘Lost Hearts’, and that’s probably a lot less of a coincidence given that there is only five years between the two. While the novel seems to be warm and sunny, the tv version is bleak, misty, grey, and altogether lacking in joy. I’m not sure where they filmed the outdoor shots but they seem to have gone looking for the most unprepossessing fields they could manage, while the railway station was not exactly a gateway to adventure. Even the shots purportedly in the farmhouse garden look less than magical, and the shots of Wingfield are grim in the extreme. One can only assume that the programme makers were in some way trying to emulate Gordon Clark, even though it was utterly inappropriate to the story. There was indeed one sequence when Penelope was riding with her uncle in the land rover and looked out to see Jude scaring birds in the field which might as well have come from ‘Lost Hearts’. I suppose all this might be argued as tying in with the rather more furtive nature of Penelope’s experience but it seemed to be a strange artistic decision. I noted earlier that the story had been updated for a modern audience, although the visual clues were maddeningly vague at times. Mostly, one had to rely on what Penelope was wearing as a guide, given the farm, the farm vehicles, and the Taberners themselves were of course behind the times. And here is the problem. In the original story, set maybe in the 1920s or early 1930s, Penelope would be dressed in clothes which, if outlandish by Elizabethan standards, could at least be excused as ‘London fashion’. 1970s Penelope by comparison would one moment be in jeans, boots and a smock top like any normal teenager of that time, and the next wearing something oddly formal or out of time, because of course she was about to move back in time. 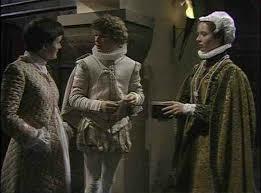 There was a quilted dressing-gown which was very frequently brought into play because it could pass muster as some sort of over-dress that wasn’t too un-Elizabethan. Also, a cloak that no self-respecting teenager of that period would have been seen dead in. In conclusion, I have to admit that despite my fond recollections of it, I am disappointed in the tv version of A Traveller in Time. I’m glad to have seen it again, and to have it to hand for reference, but the novel, for all its faults, wins hands down. The series is awkwardly put together, emphasising the novel’s flaws, and just can’t seem to find a story for itself. I wonder now if the production team was struggling to present it as a softer version of the old ghost stories, but simply couldn’t find the right register for it. By contrast, the tv adaptation of The Children of Green Knowe, despite its own occasional moments of clunkiness (we’ll draw a veil over the business of the walking tree) is joyful and magical, capturing the spirit of the novel very effectively. It’s a lovely thing to look at. Watching it will, I think, become a Christmas tradition, rather like rewatching The Box of Delights. There is the same sense of craftsmanship about it. This entry was posted in reviews and tagged alec christie, alison uttley, anthony, babington, cameron, children of green knowe, country child, denis judd, derbyshire, dethick, francis, green knowe, hemingford grey, lawrence gordon clark, lost hearts, lucy m boston, m r james, mary queen of scots, oldknow, penelope, simon gipps-kent, sophie thompson, taberner, thackers, tissie, tolly, toseland, traveller in time, wingfield on January 17, 2017 by maureenkspeller.